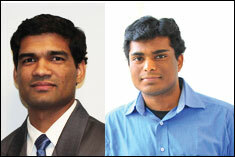 ECE Alumnus Avinash Varna (left) and ECE Graduate Student Ravi Garg (right). Ravi Garg, an ECE graduate student, and Avinash L. Varna, a recent ECE alumnus, received a Best Student Paper Award in the ACM Multimedia 2011 Conference held in Scottsdale, Arizona from Nov. 28 to Dec. 2, 2011. Garg presented the paper titled “ ’Seeing’ ENF: Natural Time Stamp for Digital Video via Optical sensing and Signal Processing“ at the Conference’s plenary Best Paper Session. The paper examines a novel technique for forensic analysis of digital video using ubiquitous environment fingerprints from power lines that gets naturally embedded in video signals at the time of recordings. This paper is co-authored with Professor Min Wu (ECE/UMIACS), the doctoral advisor of Garg and Varna. Ravi Garg is a Ph.D. student in the Department of Electrical and Computer Engineering at the University of Maryland. He is a member of the Media and Security Team (MAST) led by Prof. Wu. Previously, Garg received a Distinguished Teaching Assistant Award and an A. James. Clark School of Engineering Fellowship. Avinash L. Varna was a Ph.D student at the time of the paper submission, and subsequently graduated from the ECE department in May 2011 and joined Intel. While at the University, he received several prestigious awards, including an ECE Distinguished Dissertation Fellowship, a Litton Fellowship for academic excellence, and an A. James Clark School of Engineering Fellowship and Future Faculty Fellow. ACM Multimedia 2011 is the worldwide premier multimedia conference and a key event to display scientific achievements and innovative industrial products. The conference offers to scientists and practitioners in the area of multimedia plenary, scientific and technical sessions, tutorials, competitions, panels and discussion meetings on relevant and challenging research questions. More information about the conference can be found at http://www.acmmm11.org.